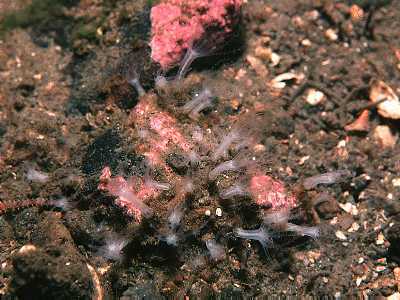 Description: This small octocoral forms an encrusting network of 2mm wide, flattened stolons on rocks and shells. Sometimes the stolons fuse to form a continuous sheet. The polyps are up to 10mm tall including tentacles, semi-translucent white. The stolon is typically red but may be yellow or colourless. Habitat: Occurs from the lower shore to at least 100m depth. May be most common in sheltered situations such as sea lochs and in small caves and beneath overhangs. Tolerates reduced salinity. Distribution: Common on all westerly coasts of Great Britain and Ireland, occasional in the North Sea. Also found around southwest Europe to the Mediterranean. Similar Species: Compare with Cervera cf. atlantica. If identification is still uncertain observe with a good magnifying glass: the stolon contains numerous minute calcareous particles (sclerites or spicules) about 0.1mm long; these are absent from Cervera. Stolons usually red and containing sclerites. Picton, B.E. & Morrow, C.C. (2016). Sarcodictyon catenatum Forbes, 1847. [In] Encyclopedia of Marine Life of Britain and Ireland.